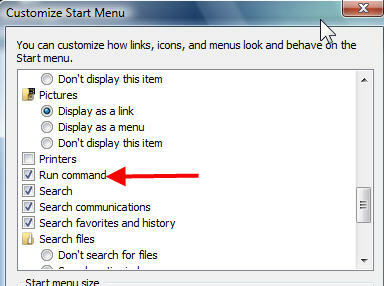 If you still don’t have any clue or get lost or simply do not know what to do when try to display Run command in Start Menu, here’s an interactive guide with screen capture illustrations that can help you enable or turn on the Run command in Start Menu of Windows Vista and Windows 7, just as how it appears by default in Windows XP. Windows 7 and Windows Vista disable and hide Run command for a reason – Start Search is simply easier and faster to use, and you should get familiar to it. Right click on Windows Orb Start button and then select Properties on the right click menu. Ensure that you’re at Start Menu tab. If you right click on Taskbar, you will come to Taskbar tab, where you need to click on Start Menu tab. There are 2 radio button available – Start menu and Classic Start menu. Click on the Customize… button at the back of the whichever radio button is been selected. 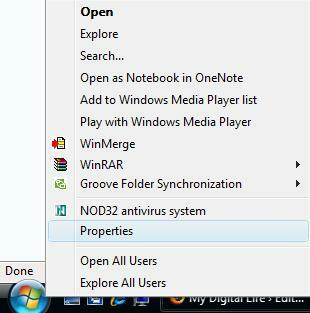 For Windows Aero enabled users, your choose is likely to be the without-classic Start menu as in figure below. For Start menu, scroll down towards the bottom of the list, and then select (tick) Run command check box. For Classic Start menu, select (tick) Display Run option. Click OK or Apply when done.